Robby Brewer lifts weights in the updated weight room at Perry County School District 32. Pirate Athletic Club donated $10,000 for improvements and new equipment. PAC will be recognized for their contribution during a ribbon cutting ceremony March 19 at Perryville High School. Athletes at Perry County School District have a safer weight room, thanks to Pirate Athletic Club. "PAC donated over $10,000 to purchase new weight room equipment," said Coach Mike Wojtczuk. "This was a major donation for badly-need equipment. The machines and equipment we replaced were old enough to be safety hazards." The donation allowed the purchase of three new power racks, a lateral pull down machine, an adjustable glute and hamstring machine, a hack squat machine, leg press, adjustable leg extension machine, new bars, new lighter rubber weights and belts. The total for the project was nearly $12,000. "PAC raises this money for the district's athletics department a number of ways," Wojtczuk said. "They operate our concession stand, hold a trivia night and host the PAC Golf Tournament every June. When you purchase a soda or popcorn from the concession stand or sponsor or play in the golf tournament, every dollar of profit comes right back to the school." PAC is a volunteer organization of parents and patrons who support the Perryville Pirate teams. Larry Pellikan is president of the club, Brian Holligan is vice president, Nancy Voelker is treasurer and Valerie Jung is secretary. Members are large are Dawn Leible and Randy Hadler. Membership also includes all parents of the current season's sports teams. Without PAC, Wojtczuk said that District 32 would not be able to offer some programs. "When we're dealing with student athletes, it's all about safety," he said. "If pads wear through and you don't have a budget to replace them, then you can't safely put kids on the field. It's that simple. PAC makes it possible for us to run safe, educational and successful sports programs." The new weight equipment is used by all student athletes, who perform sport-specific workouts designed by coaches. 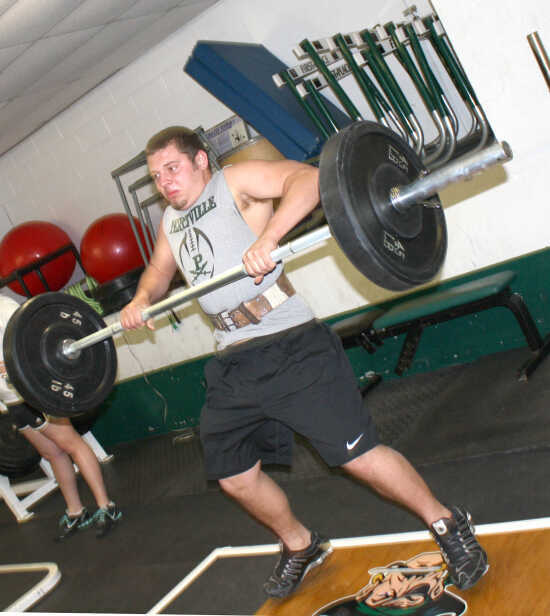 Weight lifters, football players, track athletes, cheerleaders and members of the school's baseball, softball, volleyball, golf, swimming and soccer teams all work out in the weight room. "The goal of working out with weights isn't just to get bigger and stronger," Wojtczuck explained. "It helps our athletes avoid injuries." The weight room opens around 6:30 am every school day for an hour workout and then again right after school until 5 pm. Coaches staff the weight room to supervise the young athletes, another key safety factor. "They can hurt themselves if they aren't doing their workouts correctly, so we train them to do their routines safely and then monitor them to prevent injury," Wotjczuk said. He said the new equipment is being used by physical education classes and middle school athletes as well. New bars and 10-pound rubber weights allow the beginner athlete to safely train before lifting heavier weights. Along with the new equipment, proudly emblazoned with the Perryville Pirate, sits some of the older equipment that can't yet be replaced. Some have broken pulley wheels and frayed cords. Several are patched liberally with duct tape. "Coach O'Neal and I drove to Clayton High School to pick these machines up about 25 years ago," said Coach Art Dickinson. "They were going to throw it away." Perryville athletic director Jeff Steffens commends PAC members for the generous gifts of time, talents and money. "PAC members support our student athletes in so many ways," Steffens said. "They attend our sporting events to cheer on our teams, they work at the concession stand to raise money for uniforms and equipment and they host events to increase our funding. Our athletic department would not be as successful as it is without their tireless efforts." Wotjczuk, who has taught and coached in other school districts, said that he's never seen an athletic booster club like PAC. "I think that what PAC does is phenomenal," he said. "They work with the coaches for the betterment of our kids. I can't think of a greater charitable program than PAC. It's heartening to know that they support our programs top to bottom and are behind us all the way." A Perryville Chamber of Commerce ribbon cutting and the dedication of the new weight room are planned for 6:30 pm Monday, March 19 at the Perryville High School gymnasium. A brief program will recognize PAC's efforts and then visitors can tour the weight room. "We want to honor our PAC members for their generosity," Steffens said. "We invite every member of PAC and all interested community members to visit the campus and tour the weight room." After the ceremony, PAC will hold its spring meeting at 7 pm in the gym. All parents, alumni and community members interested in Perryville Pirate sports are invited to attend and to join PAC.